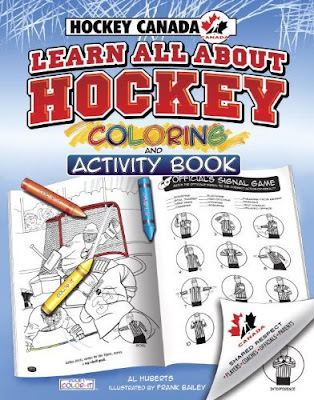 Hockey Canada's Learn All About Hockey: Color and Activity introduces young hockey enthusiasts to the game and does so through interactive pages that provide young players with the opportunity to colour in pages, follow mazes, complete word searches, spot the difference puzzles and more. All details of the game from the dimensions of the ice surface to the rules are included with images of referee hand signals for penalties, off sides, goals and more. Players are also introduced to each piece of equipment and taught about its use. The book follows two teams as the compete in an action packed game and in the process, kids will enjoy reading this exciting hockey story, while enjoying the ability to interact in the fast paced world of hockey. The book is fully endorsed and licensed by Hockey Canada, which demonstrates that the level of content is suited for all players and properly represents the game.